For trial users; this feature is available and fully functional during your trial period. SpeedBase includes a powerful custom report designer which allows you to freely design all the content and style you want to see on your report. Once you complete your design, it is saved as a new report template and can now be used any time to create a report of your records in a custom designed format. You may create any number of templates under each catalog and modify a template any time you want. Open print window, select "custom reporting" from the "report type" box. Click to "report manager" button. This will open "Report Templates" window. Click "Create New" button. "Report Properties" window will open. Click "Save & Exit" button to create the new template. Data Source: Designates the catalog from which record data will be retrieved and displayed in the report. This selection becomes permanent for this template and cannot be changed later. This selection becomes permanent for this template and cannot be changed later. 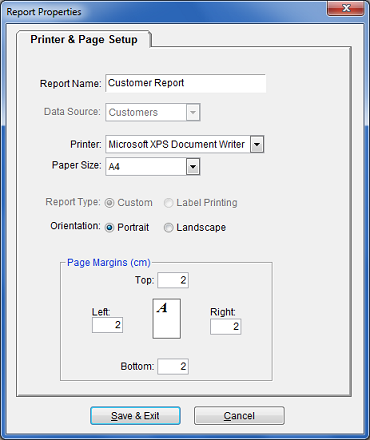 Page & Printer Settings: Select the desired default settings for this report template. Page Margins: The prefered margins here have actually no effect on design or print. They are only used to show the prefered margin positions during design. Select the desired report template from the list, click "Properties" button. Make the required changes. Note that some properties become fixed when the report was first created and cannot be changed. Click "Save & Exit" button to save changes. See Report Designer for detailed explanation about designing a fully customized report. See Label Printing if you want to print labels for mail merge. Open the record details window of the desired record, or select the record(s) from a record list which you want to be included in the report. Click "Print" button to open print window. Select the custom template you have created before from selection box. Tip: Beware that, SpeedBase will only show templates which are designed for the current catalog. If you do not see the template name you designed before, it belongs to another catalog. You should first display records of that catalog and then invoke print command. You can also check the template by clicking "custom report" button. If applicable, select the whether you want to print selected records or all records of the current view from the "data source" box. Click "Print Preview" button to see the preview or "Print" button to create the report. Tip: The preview window may not display all records requested if large number of records are sent to the preview. This will not effect however the actual printing.